Sackler Family Sued By NY State For Profiting From Peddling Oxycontin The state's attorney general is targeting one of America's richest families. A lawsuit filed Thursday claims the Sackler family, owners of Purdue Pharma, profited illegally in Oxycontin sales. 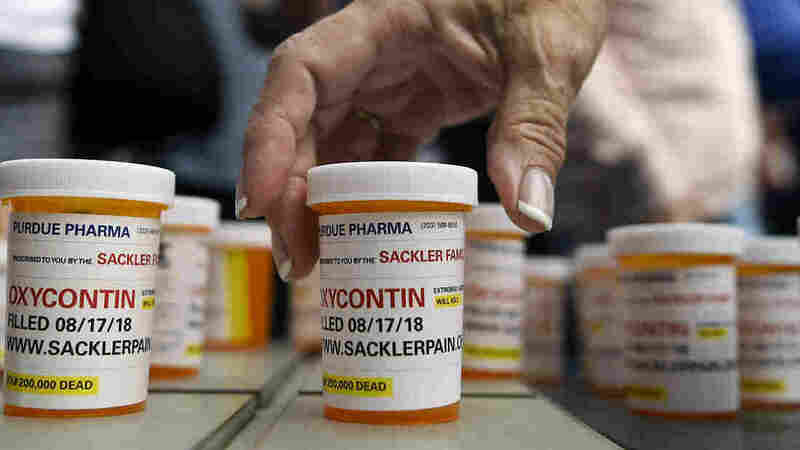 New York on Thursday sued the billionaire Sackler family behind OxyContin, joining a growing list of state and local governments alleging the family's company, Purdue Pharma, sparked the nation's opioid crisis by putting hunger for profits over patient safety. A civil suit filed Thursday accuses eight members of the family of personally contributing to the deadly opioid epidemic, which has killed more than 200,000 Americans over the last two decades, according to the Centers for Disease Control and Prevention. At a press conference, James described the Sacklers as "masterminds" of an illegal scheme that "literally profited off of the suffering and death" of New Yorkers and others around the U.S.
"This lawsuit contains detailed allegations about the Sackler family and their attempt to hide the vast fortunes they collected at the expense of actual lives," she added. In a statement sent to NPR, the Sackler family "strongly" denied the allegations and declared that they would fight them in court. "Expanding this baseless lawsuit to include former directors of Purdue Pharma is a misguided attempt to place blame where it does not belong for a complex public health crisis," the statement read. But New York's 251-page suit claims to offer new details of how the Sacklers serving on Purdue's board pushed year after year to boost the sale and consumption of their powerful opioid medications, reaping huge profits even as evidence mounted that the drugs posed a deadly risk. "We allege that the family has illicitly transferred funds from Purdue to personal trusts, so that they are potentially outside the reach of law enforcement and our efforts to seek restitution," James said. With Purdue executives now telling NPR that a bankruptcy filing is one of the options being considered, those attempting to sue Big Pharma over the opioid crisis have increasingly targeted the Sacklers' vast private holdings. A January court filing by the Massachusetts attorney general also singled out eight of the family's members who served on Purdue's board. Just this week, the Sacklers agreed to donate $75 million of their personal wealth to help fund an opioid treatment and research facility in Oklahoma, as part of an agreement with that state's attorney general. In a statement, the family described the funds as a "voluntary" donation, while Oklahoma Attorney General Mike Hunter characterized it as the product of lengthy, combative negotiations.